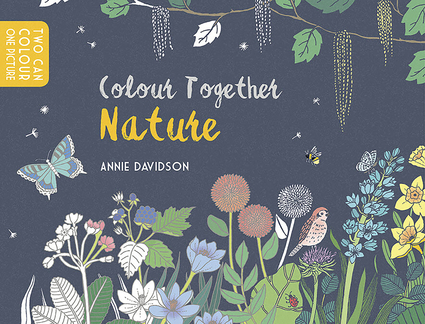 Color together and discover the incredible natural world. From a flutter of butterflies to a beachful of beautiful shells, there is a new challenge every time you turn a page. Each scene is lavishly illustrated – a large, simple illustration on one side and a more complicated, patterned picture on the other, so parent and child or older and younger siblings can have fun creating a piece of art together. Creative play is a great way to spend relaxing time together, and each page will inspire all ages to go out and discover new things about the world of nature. Annie Davidson is a Melbourne-based illustrator whose naïve and quirky drawings, filled with meticulous patterns and fine touches of detail, are created with the intention of encouraging everyone to color together. She finds inspiration in Japanese woodblocks, old botanical sketches and children's books. She has a bachelor degree in Visual Communication from Monash University Australia.